Updated: Dec. 10, 2018, 3:23 p.m.
How do you speak life into those around you during the holidays? Maybe it is through words of affirmation, or by spending quality time together. Since it is the season for giving, perhaps you show your love through gifts and by doing something thoughtful. Whatever your love language, Believers Church of Statesboro has taken acts of service as a way to show their kindness. Their evangelism program called Serve the Boro is led by Pastor Mike Oglesby, and it offers a chance for church members to give back to the community year round. They kick off their services in the weeks leading up to Easter by doing free car washes, buying down gas at Pojo’s, and handing out goodies to visitors, among various other acts. Outreach extends through the summer and into the month of October, where they host a Family Fun Night that offers free admission, food, rides, and prizes. The culmination comes during the Spirit of Christmas, when they set up a free gift wrap booth at the Statesboro Mall. This year, Believers will offer their gift wrapping services on Dec. 15, from 10 a.m. to 2 p.m.
Believers Church Administrator Amy De la Cruz had a lot of positive feedback to share regarding the event. “For me, the best part about the booth is just being able to talk to the community and hear their stories. I love seeing how much joy it brings them to let us wrap their gifts. We do it just because we love them. We don’t expect anything in return, and people are completely blown away by that. It’s just a wonderful way to connect with those that we otherwise might not have been able to reach,” she said. Serve the Boro has made such an impact on community members that it has even led to church growth. “One of our members started attending our services after we bought his gas for him at Pojo’s in Brooklet one year. We were able to pray with him at the time and he was so touched by it that he is now an integral part of our evangelical system,” De la Cruz said. Aside from the gift wrap booth, events will take place throughout the month of December for the church, including a sermon series each Sunday called “Unforeseen Christmas.” On Dec. 5, Believers will host a church-wide Christmas party that is preceded by the children’s Christmas program called “Jingle Jam,” starting at 6 p.m. On Dec. 16, Believers will have their “Celebrate Christmas” musical, with show times at 9 and 11 a.m. 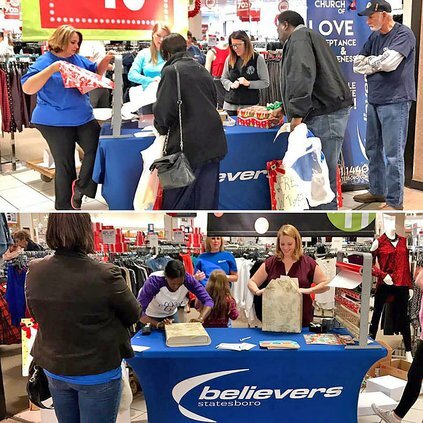 There is also a Christmas Eve vespers service at 11 a.m. and 6 p.m.
For more information about Believers Church of Statesboro, meeting times, and services they offer, visit their website at https://believersstatesboro.com/ or stop by their location on Harville Road during hours of operation.